So one of the main tasks we’ve had to tackle while preparing for the baby is setting up our bedroom to have a nursery corner. We’re not doing a separate nursery at all in our current house. Most of the reason for this is the fact that the American Pediatric Association recommends sharing a room with an infant (but not a sleeping surface) for the first year. Given that we might end up moving closer to my husband’s job within the next year, it doesn’t make sense to set up a nursery that we might never use. 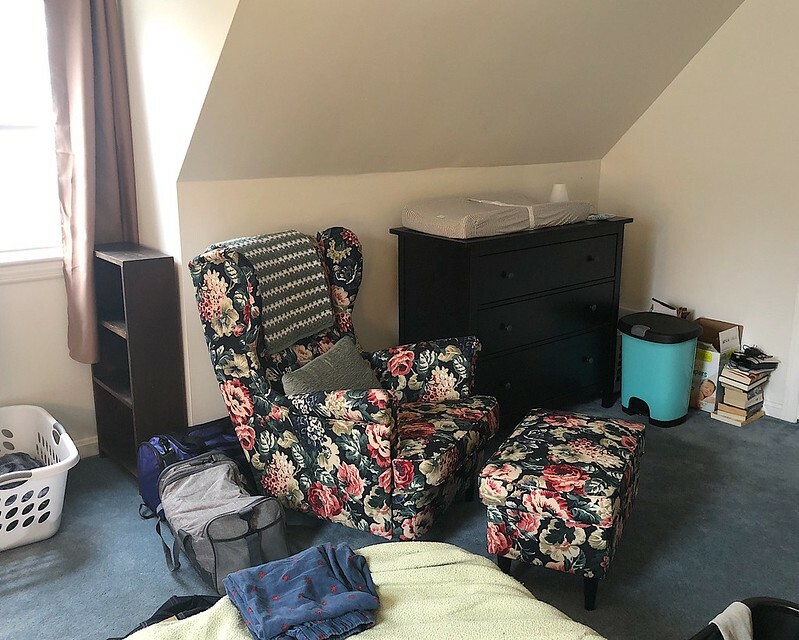 Plus, we have two additional bedrooms besides our room and one is downstairs from us and the other has the worst climate control (tends to get hot in the summer and cold in the winter), so therefore neither are a great choice for a baby. This is why we’ve chosen to set up a kind of non-nursery in our bedroom. We’re fortunate to have a large bedroom with plenty of space for a third dresser, an arm chair, and a crib. And we’re also fortunate enough that Dan has a coworker who wanted to lend us their Halo Bassinest, so we didn’t have to fit a crib in right away. 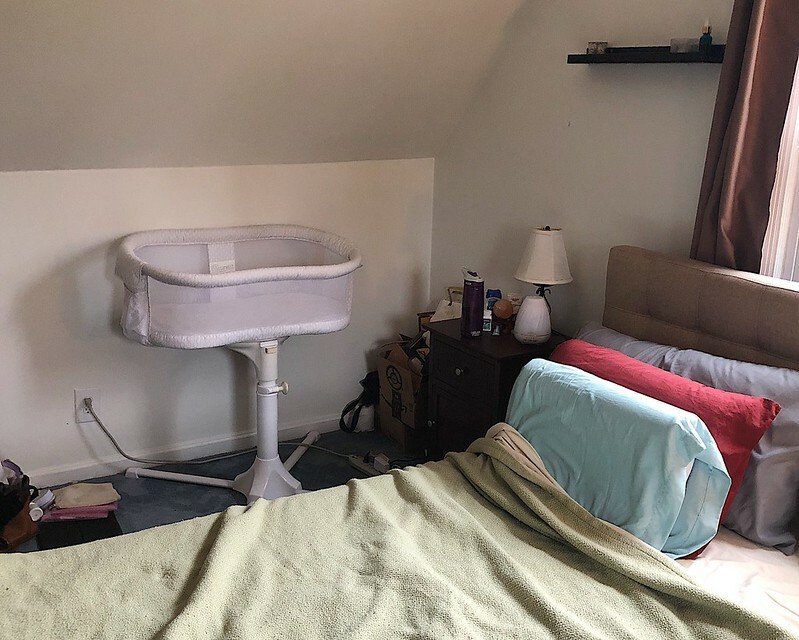 So we’ve set up the bassinet right next to my side of the bed to make night-time feeding easier, and then set up a dresser (which doubles as a changing table) and an armchair on the other side of the room. It’s still a work in progress, but previously, this space was occupied by boxes that we still hadn’t unpacked in three years of living in this house. Preparing for baby has forced us to go through a lot of our clutter and get our own lives in order before we could make room for baby, which is an interesting metaphor. But at this point, we’re mostly prepared. The furniture (courtesy of our local Ikea) is assembled and placed. We have clothes and supplies stocked in the drawers, and a place to rest and hold the baby. Plus a place for them to sleep. And having that ready has done a lot towards helping us both feel more like we’re ready for this giant change to our lives.